It is often said that World Cups are not ideal homes for tactical innovations. Superior quality ultimately shines through in the month-long affair, where plucky minnows sometimes pull off an upset or two by resorting to game-breaking tactics. Shoehorning 64 matches into one or two tactical templates is unfair, and the ongoing 2018 World Cup serves as the best example. Already 48 matches down, this World Cup has been a wonderful mix of the expected and the unpredictable. While the likes of Spain have hardly strayed from course, others like Croatia and Mexico have been refreshingly inventive to progress into the knockout rounds. Mexico’s defensive switch against GermanyHere we take a look at the top tactical variations, in-game as well as from one game to the next, from the group stage of the 2018 World Cup. Mexico pulled off a fine 1-0 win over Germany in the first round of group stage fixtures by virtue of some devastating counter-attacks. El Tri’s 4-3-3 setup was built to play fast transitions by winning the ball in midfield and attacking the heart of Germany’s defence with their jet-heeled forwards combining well in numerically advantageous situations. Hirving Lozano’s winning goal came about in the same manner. However, it was what happened after Mexico took the lead that is of greater significance. Germany, expectedly, piled numbers forward in search of the equaliser but Mexico’s defensive changes meant the 2014 champions faced a brick wall. First, Carlos Vela was replaced by fullback Edson Alvarez as El Tri sought more solidity in their three-man midfield and later, Rafael Marquez came on for Andres Guardado to help his team transition to a 5-4-1 shape. Those defensive switches by Juan Carlos Osorio forced Germany into speculative efforts from distance and expertly pulled the plug on their counter-attacking brilliance in the game at just the right time. The second half of the game witnessed one of the finest defensive displays of this World Cup so far. For anyone wondering, Blaise Matuidi isn’t a wide midfielder. The Juventus central midfielder was stationed wide on the left in France’s 4-2-3-1 system against Peru — a move which paid dividends. Having struggled to break Australia down and also being susceptible to attacks with N’Golo Kante overworked in their previous game, Didier Deschamps jettisoned the expansive 4-3-3 setup in the Peru clash. The France manager turned to his trusted lieutenants in Matuidi and Olivier Giroud, who started in front of Antoine Griezmann in attack. Matuidi’s conservative positioning added defensive stability to France’s shape and freed left-back Lucas Hernandez to make deep runs. With Paul Pogba also playing through the same left side of the pitch, France’s positional attacks mostly originated from that side, leaving the dangerous Kylian Mbappe isolated on the right flank. Mbappe scored the winning goal in that game, vindicating Deschamps choice of tactics as Giroud’s presence up top allowed Les Bleus to move the ball into higher areas of the pitch quicker. France’s change of setup with Matuidi and Giroud’s presence made them defensively more stable, allowed quicker build-up and made use of Mbappe’s tremendous 1v1 ability at high speed. There should be no looking back for Deschamps now. 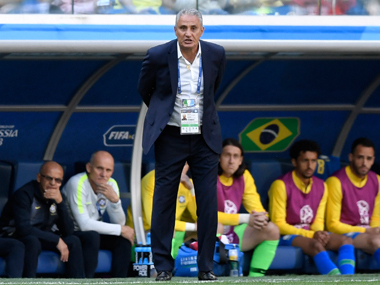 Brazil had been struggling to break a resolute Costa Rica down in their second group stage game when their manager Tite effected a few changes that completely turned the course of the match. Costa Rica were defending in a compact 5-4-1 formation denying any kind of space to Brazil’s collection of tricky, nippy wingers and forwards. To combat the ultra-defensive Costa Ricans, Tite adjusted his team’s shape a little, allowing the fullbacks Marcelo and Fagner to play in the half spaces. This was done so that the wingers Neymar and Willian stayed very wide, stretching Costa Rica’s wingbacks in their 5-4-1 setup. That opened up space for Philippe Coutinho and Paulinho as Brazil’s fullbacks started occupying the attentions of Costa Rica’s wide midfielders. That slight tweak meant that from a 1v3 disadvantage for striker Gabriel Jesus, Brazil had a 3v4 situation in the centre leading to more shots as the game progressed and finally a much-needed win. Croatia’s 3-0 win over Argentina was one of the standout results of the group stage but it was all a product of sound counter tactics from the Vatreni manager Zlatko Dalic. Dalic, who started with a 2-1 midfield of Luka Modric-Ivan Rakitic double pivot with Andrej Kramaric ahead of them in Croatia’s opener against Nigeria, turned his 2-1 midfield upside down against the Argentines. In came Marcelo Brozovic as the No 6, while Modric and Rakitic played as double No 8s. Against Argentina’s 3-4-3, Croatia’s system worked like a charm as they pressed in their own defensive zones well. Croatia’s wingers Ante Rebic and Ivan Perisic marked Argentina’s wingbacks, while their fullbacks were oriented on the Albiceleste wide forwards. That left main striker Sergio Aguero isolated against the two centrebacks as well as Brozovic. Ahead of Brozovic, Modric and Rakitic marked Argentina’s two central midfielders while Mario Mandzukic covered centreback Nicolas Otamendi, only leaving the other two centrebacks free. That defensive shape meant Argentina lacked creativity during buildups with all their advanced players well covered. When Lionel Messi tried to move infield to break away from his fullback marker, he encountered Brozovic in that space. That congestion of space saw Argentina fail to create much of note, while adequate spacing of Croatia’s players allowed for effective counterattacks for the Vatreni. Uruguay qualified for the Round of 16 at the end of their second group stage fixture but things weren’t fluid at all for Oscar Tabarez’s side at that point. La Celeste had been far from their best, with midfield dynamism proving to be a cause for concern. Their final group game against Russia provided Tabarez the chance to experiment with his setup once again, and he finally got it right with a midfield diamond. Young defensive midfielder Rodrigo Bentancur played at the tip of the diamond behind the strikers Luis Suarez and Edinson Cavani, while Lucas Torreira came into the team to play at the base of the diamond. Matias Vecino and Nahitan Nandez were the wide midfielders in Uruguay’s diamond which added more defensive stability as well as more ammunition for Suarez and Cavani. Uruguay ran out 3-0 winners against the hosts and even restricted them to just three shots all game, highlighting the fact that Tabarez got his tactics spot on. Bentancur’s advanced positioning meant he could combine better with the strikers, while Torreira, Vecino and Nandez formed a line of three behind the Juventus midfielder in defensive phases, maintaining the team’s shape even if the fullbacks bombed forward. This should certainly be Uruguay’s go-to plan heading into the Round of 16.